Registration: At registration you will be given a bib number and a D-tag. Please wear your bib number on the front so it is easily visible. Please attach the D-tag properly to your shoe laces. 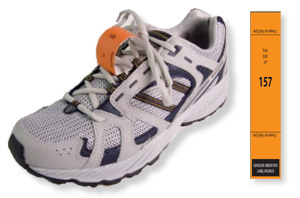 Click below to either display the PDF of written instructions or watch the instructional video for attaching the D-tag properly to your shoe laces. If this will be your first time using a D-tag timing device, it may be helpful to print out the PDF instruction sheet and bring it with you to the event. Timing: Special mats will be placed at the finish line. You must cross over the mats to receive accurate times. IF YOU DO NOT WEAR THE D-TAG PROPERLY OR DO NOT CROSS OVER THE MATS, YOU MAY NOT RECEIVE A TIME. At most events, awards will be given according to official gun time because USAT&F currently only recognizes official gun time for records, rankings, etc. Benefits: D-tags are disposable timing devices. They will not be collected after the event. You may properly dispose of them any time after the event. No more fees for not returning the chip timing device. © Copyright Queen City Timing. All rights reserved.